Kaipara College is a uniform school. Parents are required to ensure that their children wear correct school uniform. The school will not grant permission for students to wear non-uniform items on an extended basis, unless approval has been given by the Deputy Principal in charge of uniform or the Principal. Permission will only be granted in medical circumstances where there is appropriate medical documentation provided. In rare circumstances, students may not be able to wear a uniform item. Parents should write a note to the school explaining the circumstances and the school will issue a permit which is only available from the Deans office during Form time. The school reserves the right to require students not in correct uniform to wear loan items of uniform while at school. 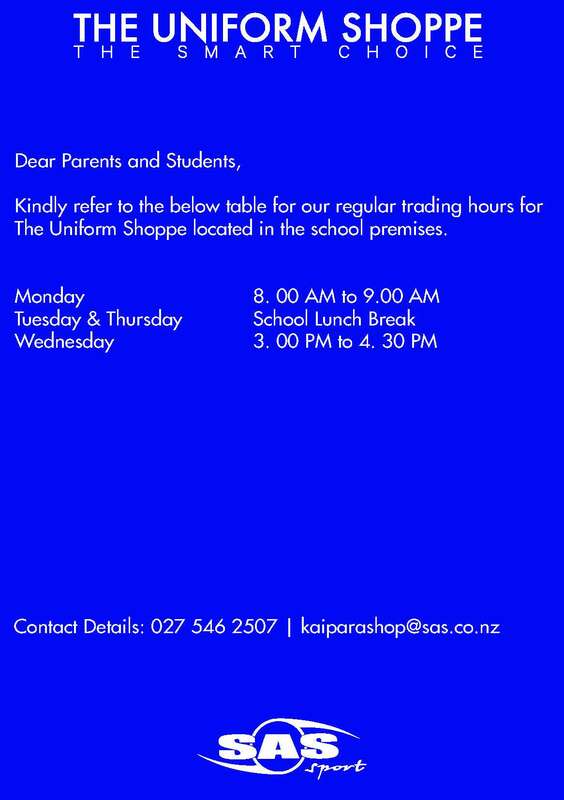 The uniform shop is located near the school reception. Eftpos, Credit Card, Cash and layby with a small deposit, are available at the shop. Quotes for Income Support can be given. Visit the uniform shop for a fitting first. Only school sanctioned items (listed above) are to be worn as part of the uniform. Year 13 students are permitted to wear ‘Number Ones’. I.e. a matching navy coloured suit set (pants/skirt) with white blouse/shirt. Extremes in personal presentation or adornment that might be considered incompatible with our uniform standards, or is considered a safety issue, is at the discretion of the principal. Under garments (eg. thermals) are allowed to be worn, but must not be visible. When wearing the school hoody the ‘hood’ must be down at all times. The only hoody permitted is the one sold in the uniform shop. During Terms 2 and 3, students may wear plain navy blue or plain black waterproof jackets to and from school and during break times. Rain jackets are not to be worn during lessons. Puffer jackets are not permitted. Skirts are to be worn at knee length. One small nose stud is permitted. Small studs in pierced ears are acceptable. Only small and round ear stretches are permitted (no other jewellery is permitted other than a wrist watch). Make-up is not to be worn.